Theatre is regarded as the first step to achieve a full-fledged and a successful acting career, the aspiring actors go in for theatre not only to improve but to enhance their acting skills. It teaches them to present live performances in order to depict the experience of a real or imagined event in presence of a live audience. An introduction to what is acting all about? Graduated from the National School of Drama, New Delhi; Mr. Pandya has conducted workshops of puppetry, song and street play workshops for school teachers, theatre workshops for children with disabilities. He has also worked in many films including the latest hit flick Vicky Donor, Hazaron Khwahishein Aisi, Dussehara and Jeet and Serials which includes Circus, India’s Most Wanted, Ehsaan, Kabhi aaye na Judaai and Kyunki Jeena Isi Ka Naam Hai. He has also done voice over for Pahunchaaye Apki Awaz Ap Tak Aaj Tak, Aaj Tak Channel and have an experience of 7 years in All India Radio. Mr. Sonwal is a Multi-dimensional and versatile personality who has worked with various legendary directors including Mr. Qayyum Ali Bohra, Mr. Rizwan Zaheer Usman and Mr. Deepak Dixit, etc. From past 5 years has directed 12 plays and all were successful and appreciated. His other productions are Dard Ek shahar Ka, Court Martial, Ajanmi Duniya, Savdhan! Hum Aatmahatya Karte hai…., Hawaalat, Rahogi Tum Vahi…!, Roti ka Jaal, Bechari Aatma and Mughlon ne saltanat baksh di. He has been trained under India’s Best Theatre Directors Mr. Bhanu Bharti, Mr. Vagish kumar, Miss Rita Ganguly, Mr. Subba Rao and Mr. Ashok Bantiya and has got trained on make-up, lights, backstage, costumes and property. He has directed many plays namely Tenali Ram, Fatichaar Joote, Kaya Kalp, Andher Nagari, Mahaveer ang Gaj Moti and has conducted many theatre workshops for The Study School, Kendruya Vidhyalaya, ALok School, Central Academy and Sangeet Natak Academy (Rajasthan) and has also acted in 6 films and 5 TV. Serials . 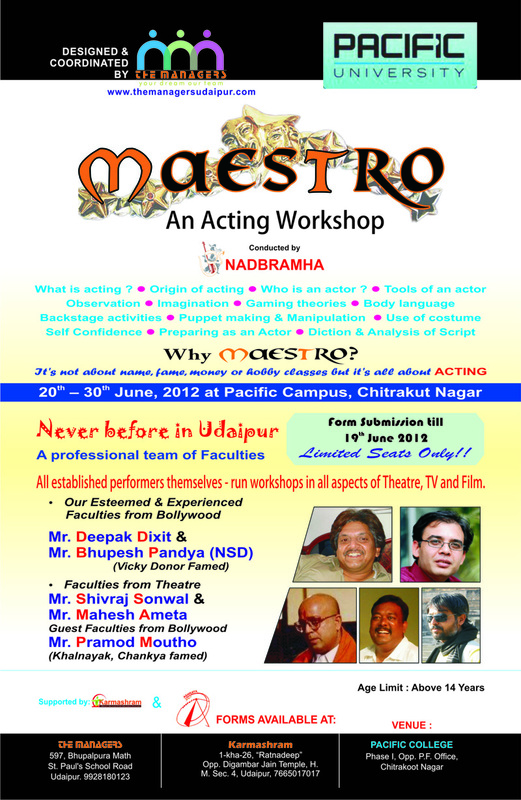 The Chanakya and Khalnayak fame Mr. Moutho will be accompanying the other faculties as a guest faculty at the workshop. The event is designed and coordinated by The Managers, and supported by Karmashram and Ashraya. The workshop will be conducted at Pacific Campus, Chitrakut Nagar which will be starting on 20th June to 30th June, 2012; forms of the same to be submitted by 19th June. Age Limit of the Would-be actors is 14 years and above. So, all the young and talented Udaipies buckle up and get ready to start your journey of becoming a STAR. I am an engineering student in udaipur and not at all interested in this field. My interest is in acting, modelling and anchoring. So if I want to join any theatre or if I want to become a model, what should I do? Do I join your theatre? I m not a rich guy so.dont expect any kind of investment from me as I dont want to let it know to my parents. im intrested for thi acting workshop.